Like many fellow climate activists, I often despair for the fate of all I hold dear. But I recently read Al Gore’s article, “The Turning Point: New Hope for the Climate,” in The Rolling Stone. Gore has persuaded me that there is ample reason to hope. While it is true that it is too late to stop global warming, and that our efforts must be directed to preventing the worst scenarios from becoming reality, he shows that many positive changes are taking place. And many of these changes are occurring more rapidly than scientists had anticipated. I summarize here some of the very hopeful points in Gore’s article. If you’d like to read the whole piece, just click on the link at the end. Our ability to convert sunshine to usable energy has become much cheaper far more rapidly than anyone had predicted. The cost of electricity from photovoltaic, or PV, solar cells is now equal to or less than the cost of electricity from other sources powering electric grids in at least 79 countries. By 2020–as the scale of deployments grows and the costs continue to decline–more than 80% of the world’s people will live in regions where solar will be competitive with electricity from other sources. In the U.S., where up to 49% of new generating capacity came from renewables in 2012, 166 coal-fired electricity-generating plants have either closed or have announced they are closing in the past four and a half years. An additional 183 proposed new coal plants have been canceled since 2005. India’s new prime minister Narendra Modi (who has authored an e-book on global warming), has launched a stunning program that is bringing solar-generated electricity to 400 million people who have never had electricity before! Bangladesh is installing nearly two new rooftop PV systems every minute–making that country the most rapidly growing market for PV in the world. At the start of the 21st century, some scoffed at projections that the world would be installing one gigawatt of new solar electricity per year by 2010. That goal was exceeded 17 times over! Last year it was exceeded 39 times over! And this year the world is on pace to exceed that benchmark as much as 55 times over. The cost of wind energy is plummeting. Since 2009 it has dropped 43% in the U.S. Wind energy is now cheaper than coal for new generating capacity. Worldwide, in 2010, wind deployments were seven times greater than projections made in 2000. Now, wind deployments are more than 10 times that projection. In the U.S., nearly one-third of all new electricity-generating capacity in the last five years has come from wind, and installed wind capacity in the U.S. has increased more than fivefold since 2006. While the cost of carbon-based energy continues to increase, the cost of solar electricity has dropped by an average of 20% per year since 2010. President Obama, mostly a disappointment when it comes to action on climate, is finally stepping up the pace. He has empowered the EPA to enforce limits on CO2 emissions for both new and existing sources. He has enforced bold new standards for the fuel economy of the U.S. transportation fleet. Because Obama is making reductions in CO2 a much higher priority than he did in his first term, he will bring to the 2015 global climate talks in Paris a credibility and moral authority that he lacked during the disastrous world meeting in Copenhagen in 2009. China’s new president Xi Jinping has launched a pilot cap-and-trade system in two cities and five provinces as a model for a nationwide cap-and-trade program in the next few years. He has banned all new coal burning in several cities and required the reporting of CO2 emissions by all major industrial sources. The U.S. and China have reached an agreement to limit another potent source of global warming pollution–the chemical compounds known as hydro-fluorocarbons, or HFCs. Warren Buffett has announced that he is ready to double Berkshire Hathaway’s existing $15 billion investment in wind and solar energy. A growing number of large investors–pension funds, university endowments, and others–have announced decisions to divest from carbon-intensive assets. The stock exchanges of Sao Paulo and Johannesburg have decided to require the full integration of sustainability from all listed companies. Standard & Poor’s has announced that some nations vulnerable to the impacts of the climate crisis may soon have their bonds downgraded because of the enhanced risk to holders of those assets. While most Americans believe it is important to treat people with consideration, we don’t, for the most part, extend that consideration to the people yet to come, our descendants. As a culture, modern America is dramatically different from the Iroquois Nations. Their culture embraced the ethic that the making of any major decision must include that decison’s impact on the seventh generation to come. In other words, how would current actions affect the people who would be living as much as 175 years later? I would be a lot less worried about our planet and what’s in store for the coming generations if my culture had an ethic similar to that of the Iroquois. Even so, there have been influential individuals in our culture who have acted with future generations in mind. One such person was Theodore Roosevelt. As President (1901-1909), he established the National Wildlife Refuge System, so that wild places and the birds, fish, and other wildlife that inhabit them would be protected from poaching, over-hunting, and commercial use. Roosevelt worried that the marvels of wilderness he so enjoyed would not be there for future generations, unless his generation took action to protect them. “The western-most island we visited was outside the national reservation, and that very morning it had been visited and plundered by a party of eggers. The eggs had been completely cleared from most of the island, gulls and terns had been shot, and the survivors were in a frantic state of excitement. “It was a good object lesson in the need of having reserves, and laws protecting wild life, and a sufficient number of efficient officers to enforce the laws and protect the reserves. ‘Defenders of the short-sighted men who in their greed and selfishness will, if permitted, rob our country of half its charm by their reckless extermination of all useful and beautiful wild things sometimes seek to champion them by saying that ‘the game belongs to the people.’ So it does; and not merely to the people now alive, but to the unborn people. ‘”The greatest good of the greatest number” applies to the number within the womb of time, compared to which those now alive form but an insignificant fraction. Our duty to the whole, including the unborn generations, bids us restrain an unprincipled present-day minority from wasting the heritage of these unborn generations. I recently read a statistic that I could hardly believe. Every day, the world’s population increases by 227,000 people! 227,000! That’s like adding a mid-sized city every single day. And this 227,000 figure is not the number of births each day; it’s the number of births minus the number of deaths, or the net increase. 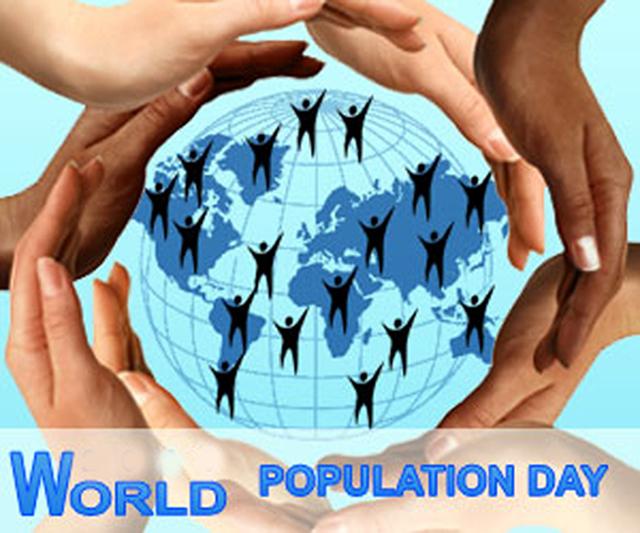 I am thinking about world population because tomorrow, Friday, July 11, is World Population Day. This annual observance was established by the United Nations in 1989 as a vehicle to build awareness of population issues and the impact they have on the environment and on development. The United Nations Population Fund encourages governments, non-governmental organizations, institutions, and individuals to organize educational activities to mark the annual event. Why July 11? That was the day in, 1987, when the global human population first reached five billion. The Day of Five Billion attracted so much interest all around the world that the UN and population educators joined together to create an annual occasion to focus the world’s attention on the challenges posed by population growth. Global population growth is truly a fascinating phenomenon. Long, long ago, when humans lived in bands of hunters and gatherers, the population was small and stable. Then, with the advent of agriculture about 10,000 years ago, more food became available and the human population began to grow. Then came the Industrial Revolution in the 1700s. With expanded agriculture and life-saving medical advances, the human population started to increase exponentially. About 8,000 BC when farming began, the global population was about 5 million. By about 1 AD, 8,000 years later, the population was about 200 million. About 1800 years later, by 1800 AD, the human population reached its first billion. By 1930, just 130 years later, the population crossed the 2 billion mark. By 1959, a mere 29 years later, the population had grown to 3 billion. By 1974, only 15 years later, the world population reached 4 billion. In 1987, 13 years later, there were 5 billion of us. The 20th century began with 1.6 billion people and ended with 6.1 billion. Most of the population growth throughout history took place in a single century! Today, the global population is 7.2 billion. With Independence Day approaching, I am reminded of how grateful I am to have lived all my life in this free and independent country. Like most Americans, I cherish my individual freedoms. Yet, at a deeper level we are all completely dependent. We depend for our very lives on clean air and water, on a climate that continues to enable us to feed ourselves, on natural beauty and healthy ecosystems that nourish our spirit. So, in addition to reading the Declaration of Independence, as I always do on July 4, I will also take the time to read the following Declaration of Dependence. Written in the same format as the Declaration of Independence, it states clearly what humanity needs to do to provide our children with a livable planet. causes that impel such demands be set forth. planetary climatic change that endangers all life forms. imperiled on a global scale. locales, water borne flora and fauna struggle to survive. and animal species by disrupting, polluting and destroying their habitats. these practices jeopardize the Earth’s agricultural bounty. sustain trees that recycle carbon dioxide into oxygen. causing pollution to land, air and water. on Earth and threaten our ongoing survival. environment and are unfit to shield the Earth from harm. on Earth, and appealed to their intrinsic bonds with nature and religion. Enemies to our continued existence. pledge my life, worldly goods and sacred honor. You are currently browsing the Earth Connection blog archives for July, 2014.